This is a little something I’ve been working on for a while: A replacement (or better: enhancement) of WPF’s built-in TreeView control. I became aware of the default control’s limitations during my last project – I naturally started with hierarchical data templates, but was soon confronted with quite a few issues: I missed a simple API to control the tree, and styling of the tree’s nodes proved hard as well. Furthermore, WPF’s TreeView tends to fire all sorts of SelectedItemChanged events if it’s being refreshed or rebound, which caused side-effects with TwoWay data binding. 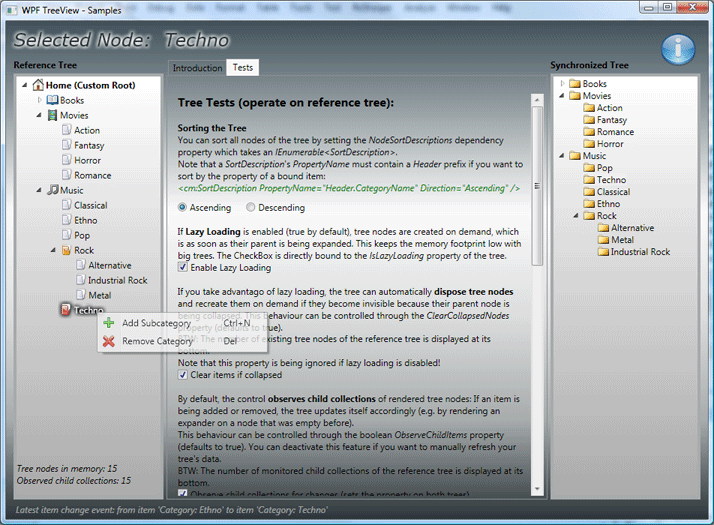 Lazy loading support – does not create tree nodes until the parent node is expanded. Also provides the option to automatically clear invisible tree nodes. This allows either virtualized trees in case getting data is expensive, or low memory trees that keep the number of tree nodes at a minimum. Simple styling on every level: Tree, TreeViewItem, or bound items (via DataTemplates). Tree layout can be cached, saved and reapplied. 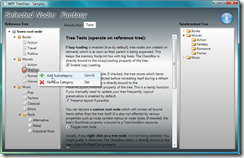 Access to tree nodes (TreeViewItem) through bound items. I’m planning to write a CodeProject article for this one, but for now, it’s only available through my place without a tutorial. However: The library comes with a sample project that shows pretty much all features of the control. Project format is currently VS2008 only, but binaries which target .NET 3.0 are included. Enjoy!